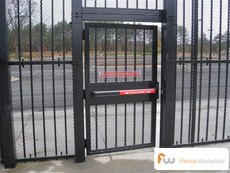 Our Ameristar™ Matrix security fence systems are is designed for heavy industrial and security uses. At Fence Workshop™, we take security very seriously and value the security of our fences above all other things. We supply Matrix® Security Systems in Atlanta, Raleigh, Jacksonville and other Southeast areas. Matrix® security fences by Ameristar come with a best in class manufacturer warranty, making it a best buy for safety and security fencing in the Southeast. As the world’s leader in security fencing, Ameristar Fence Products® continues to deliver innovative products that outperform the industry standards. Matrix® provides the widest range of security filler options, each with unique properties for visual deterrent and physical delay. 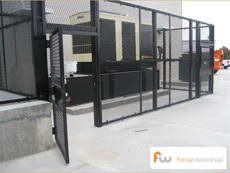 The Matrix® security fence is modular, versatile and flexible. The modular design of the Matrix® system makes it easy to install additional areas or to reconfigure the enclosure layout to match project demands. The unique design of the Matrix® security partition can be fitted with a specific filler material that meets the security requirements of the project. The standardized components of the Matrix® system allow for a quick and simple installation. Matrix® is designed to be fitted with a filler that can best match the level of security required. Each of the Matrix® fillers have unique characteristics that provide specific levels of delay and visual screening. The myriad of different filler options offered with the Matrix® system make it easy to find a solution to match any project. *These Custom filler options available upon request. Number of rails will be based on fence height – Rail size: 2” x 16 ga. The H-Channel aluminum extrusion is used to join consecutive meshes, and is located at the start of each filler. Matrix® is protected with Ameristar’s unique PermaCoat® multi-layer coating process. The combination of these layers delivers a system that increases weathering resistance and product durability. Ameristar™ Fence Products’ Matrix® security fence is more than just a fence, it’s a security system that is designed to conform to a variety of applications and allows for full over head enclosure if desired. 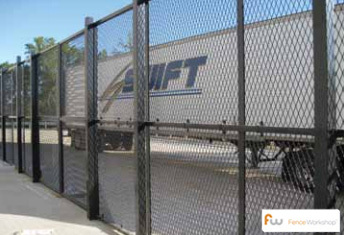 The Matrix® fence system is composed of multiple architectural mesh fillers that gives the system the ability to adapt to multiple site conditions and be customized to enclose objects from an air conditioner unit, to all interior and exterior components of an industrial facility. This enclosure fence system is available in standard as well as custom heights and can be installed at heights over 24 feet! Where do we supply matrix security fencing? 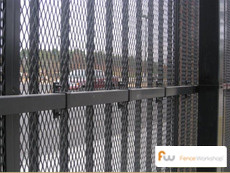 At Fence Workshop™ we supply Matrix security fencing in Georgia, Florida and North Carolina areas like Atlanta GA, Athens GA, Augusta GA, Columbus GA, Macon GA, Alpharetta GA, Marietta GA, Conyers GA, Lawrenceville GA, Woodstock GA, Braselton GA, Orlando FL, Apex NC, Cary NC, Chapel Hill NC, Holly Springs NC, Raleigh NC, Wake Forest NC and many more.